The "10% Rule" For Maintenance.....How Close Are YOU? Since the wife and I are bound and determined to ditch our apartment and move aboard a boat, I've been researching estimated maintenance costs. The one consistent piece of information I keep hearing is "expect your annual maintenance costs to run 10% of the value of your boat"
Now, I FULLY understand this is just a guideline, and actual maintenance costs can fluctuate wildly from this number based off of any number of factors. But, with that said, I'd be very curious to hear your experiences and whether you come in above or below that 10% line. For clarity, when I say maintenance costs, I'm thinking just straight up maintenance related costs WITHOUT things like moorage, insurance, or fuel. If anyone would care to share their own experiences, I would greatly appreciate it! I'm in the process of budgeting and planning to ensure that we're as prepared as we can be for this undertaking! Depends what you start out with, new, top of the line boat or the worst POS in the marina. Then, special needs, do you use a system more than others, like a type 1 MSD. Then there is maintenance and continuing upgrades, meaning when something breaks, do you just fix it, or do you upgrade it? I am on my 3rd live aboard, not sure anything but liveaboard answers matter. Owned my boat for 4 years. In 4 years I've nearly reached 72% of original purchase! Works out to 18% average per year. Those fuel tanks really pushed up the numbers. Without those tanks I would be around the 11% per year. Before you buy be sure about those fuel tanks. If you can't get an inspection in and outside of them discount your offer to reflect replacement. Of course it depends who works on the boat. If I had paid for repairs, the boat would have been a total waste. According to others, I have saved well over $100,000 in yard costs. Which is 2X the cost of the boat. But a new boat may not have needed any of those repairs. I totally understand the massive variance. Mostly I was curious just to see what the numbers worked out to for individuals who have kept track of their numbers. FWIW, we will be looking at a boat that is somewhere in the $100k - $150k range. I will be hiring the best damn surveyor I can find, and will happily pay for a separate mechanical survey to boot. I do NOT plan on buying a boat that has a lot of obvious issues that need to be fixed. I will pay extra for a boat that has been WELL maintained. As far as fixing vs upgrading, that is an interesting question. I'd like to say I'll fix it, but knowing me, I will likely be tempted to upgrade when something breaks. Thanks for the numbers and the breakdown, this is what I was looking for! Love seeing actual numbers from actual people with actual boats vs just theoretical talk. Also, great tip about the fuel tanks...I would never have guessed they would be that big of an expense! As the wise posters above have said, it depends on the condition of the boat. Someone just posted a beautiful Krogen 39 for sale by owner for $300K+. The systems installation looks first class. I would not expect anything near $30K annual maintenance costs for that boat even though it has complex systems like dynamic stabilization. OTOH, someone recently was looking for an early 80s trawler with a budget of $40K to spend. Yes I sure could expect $4,000 per month of maintenance/upgrades for that boat, probably much more. It also depends on the owner of the boat. I do not tolerate failed gear on our boat. If it is installed, it works! It makes no difference how old the boat or its condition, I keep things in working order. We now own a new boat so our expenditure should be on the light side for a bit. I've also owned 10 year old boats and two boats ago our boat was 25 years old. It was in such nice shape the dealer who sold us its replacement purchased it for his own use and kept it 10 years. I have seen 5 year old boats that are disasters due to a lack of proper maintenance. Some people just don't care and it shows. Its not predictable. You could lose an engine one year and get to 60% overnight on an older boat. In the 8 years since I took delivery, I have never come close to spending 10%. At some point, however, the value of the boat will decrease, and the need for expensive repair/replacement will increase, to the point that I hit or exceed 10%. you're dealing with 2 things...a "rule of thumb" which never applies to everyone...and an "average" which is practically useless for a sample size of one. Flip a coin once....you have a 50% chance of getting heads....but your actual results will be off by 50% from the average. I think for anyone to give you a useful answer, you'd have to describe your boat and useage a little. ie: a 15 year old, 35 foot boat with twin diesels, no generator, air conditioning, and full electonics, and you expect to run the boat for 25 hours per week. I know that may require information you don't have....but without some sort of guideline, I don't you'll get very relevent information. Fair enough. It's probably a question that can't really be answered, which is why I was just sort of curious to get anecdotal experiences of others on the forum. Again, I know this is sort of a useless exercise. But curious nonetheless. I believe the "rule" is more applicable to new boats, say over the first ten years. Older boats, especially where POV was trying to skimp, the ratio would start to climb. Most boating forums, including this one, have threads on tank replacement. 30 to 50 thousand should not be a surprise. Do some Googling and next time you are on a boat, any boat, ask yourself how you would get those 2 tanks out and 3 or 6 back in. If I paid 100k for a 30 year old 40' boat in Seattle, I would want close to that same amount in the fix it bin. To start. A "quality survey" won't guarantee no leaks a month after delivery and if you can't prove 30 year old tanks are sound consider they aren't. Last year, 2 mid 80s, 40 something Tollys had tanks replaced. One at 50k the other 60...Canadian. I know you want to live aboard but it would be a shame, if an unbudgeted turbo, shaft or whatever you didn't guess would be that expensive, kept you from using it as a boat also. Go wander some local yards and marinas. Ask questions. On the other hand, here is a nice little unit in your neighbourhood that, based on the pictures, is likely a decent buy and could be lived on. Going by what I see, I still would want the tanks to be proven sound and if the glass decks are original or a teak replacement. In the first year of our latest boat we have spent over 20% of the purchase price. At least half of that was upgrading the electronics, which we (or at least I) had considered in the purchase price. The rest of the costs would be considered normal maintenance. So the 10% guesstimate would be close in my case. Jeff, while I have not kept close track, I'd guesstimate that our maintenance and repair cost for our boat, which we bought in 2010, ran about 5% for the first 5 years. I did the oil changes, impeller changes and as much of the maintenance myself as I could. Then, in 2015 we had a runaway starter on the starboard engine and that threw everything out of whack. By the time that was all done being repaired the total cost was a bit north of $35K. That's the downside. The upside is the insurance company picked up the entire cost and I ended up with: New gauges on the upper and lower helms, two new wiring harnesses, a new battery charger, 8 new batteries, new starter and an assortment of other stuff. Thank you Insurance Company.. Since then we're back in the neighborhood of about 5% per year. Admittedly I'm a major cheapskate. I buy my oil every time Costco has a sale and stock up on it. I buy my filters online, same with impellers. I do my own wax jobs, bottom painting, etc. I don't want to pay some wrench monkey $75-$100/hour for stuff I can do myself that requires no special knowledge and just requires some time and the willingness to get dirty and sweat a bunch. One year including last Spring's haul - just what I can remember. About 30% of the total. Don't plan on buying boats every year but next year haul again, renovate one cabin, new mattress, possibly new settee etc. The ONLY labour I paid for was the bottom paint and welding on the zincs. My six-year-old boat cost about $300K new of which use tax, oversea transportation, and import tax represented one-fifth of the cost. Annual maintenance (engine work, bottom/zinc treatment), improvements such as access hatches to hull under the master bed, raising the anchor locker floor, and paint touch up (steel boat) has annually averaged less than three percent of original cost. 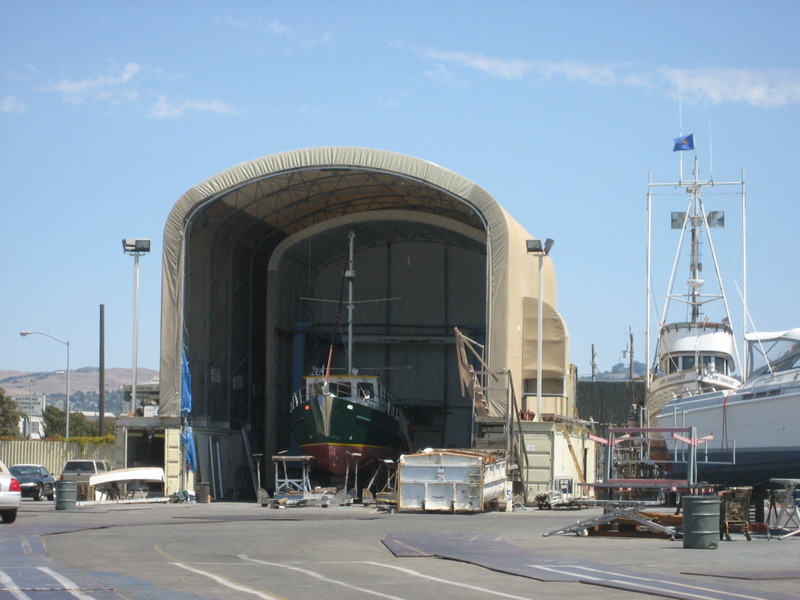 Virtually all work was done by professionals at one of the Bay Area's premier boat yards. Of course, if the boat cost me $100K, the percentage would rise to nine percent; at $50K the percentage would be eighteen. In 5 years of owning this boat, I haven't had any major repairs. I have done things like new enclosure for back deck, new flooring, LED lighting etc. Things I wanted to do not needed to do. I have not come anywhere near 10%. I did have to replace the 4, 8D batteries and I went with AGM that cost me right around 2 grand but I got a 5 year warrenty and They are still in perfect shape 4 years later. I could have spent less but choose the AGM's over trying to maintain regular batteries as I am gone alot for work.